. tenryō 天領 Tenryo Government Land "Land of Heaven" . Part of Bungo is now in Oita prefecture, part in Fukuoka. 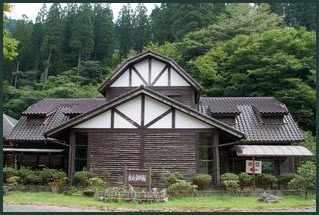 Hita (日田市 Hita-shi) is a city located in Ōita Prefecture, Japan, that was founded on December 11, 1940. It is an agricultural and industrial centre that primarily produces lumber, furniture, and pottery. Its attractions and scenic beauty also make it a popular tourist destination. ..... Hita is located in the far west of Ōita Prefecture, and borders the neighbouring prefectures of Fukuoka, and Kumamoto. Surrounding cities include Kurume to its west, Nakatsu to the north, and Kusu to the east. ..... Many rivers that run through Hita join up to the Mikuma River. This river was used to distribute lumber to Kurume and Ōkawa at the end of the Edo Period but with the completion of the Yoake Dam, the use of this route stopped. In 1593, Hita came under the direct control of the Toyotomi Household as the main city overseeing Kyushu. After the completion of Hinokuma castle and fortification of Nagayama castle, Hita passed from the Toyotomi household to the new Daimyo Tokugawa Ieyasu and became a "Tenryo" town, in which the town was under direct control of the Tokugawa Shogunate. After the Meiji period it was known as Hita Prefecture, and after that, it was assimilated into Ōita Prefecture. ..... During the Edo period, Hita was modeled after Kyoto and its merchant culture, and even now, it is called "Little Kyoto". 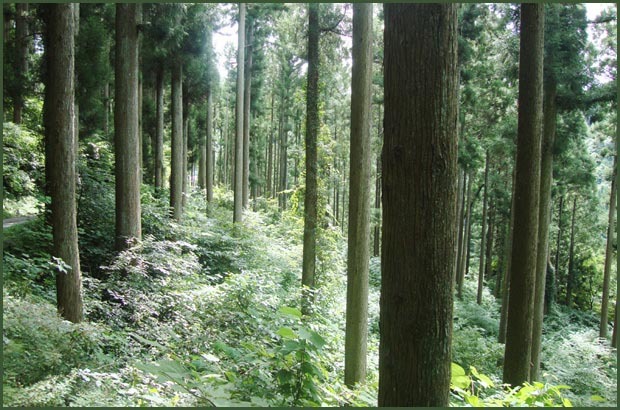 Hita is famous for its quality bamboo and cedar timbers. This resource made it to a Tenryo. 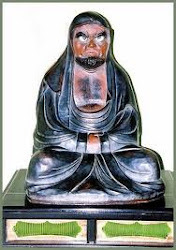 Hita prospered as tenryo 天領 (direct controlled territory of Edo Shogunate) during the Edo period (1603-1868). It is called "Little Kyoto", and has old buildings standing in a row, even today, near the hot spring resort. In Mameta town, you can enjoy a stroll through the historic streets. 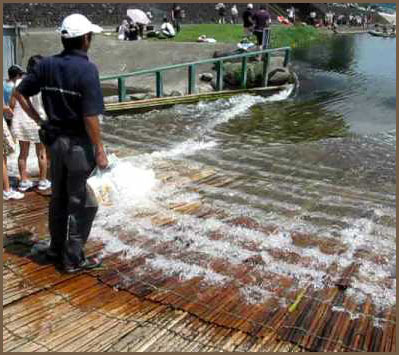 Hita hot spring is known as "spring for birth", and is effective for neuralgia, recovering from fatigue and more. Once the largest gold mine in the East (42 tons), this mine stretched 110km in length. Now about 800m has been recreated as an underground museum to demonstrate the gold mine in the old days. The gold mine was closed in 1972. Along the Mikuma river from July till November.
. yana 魚簗 (やな) fish trap . 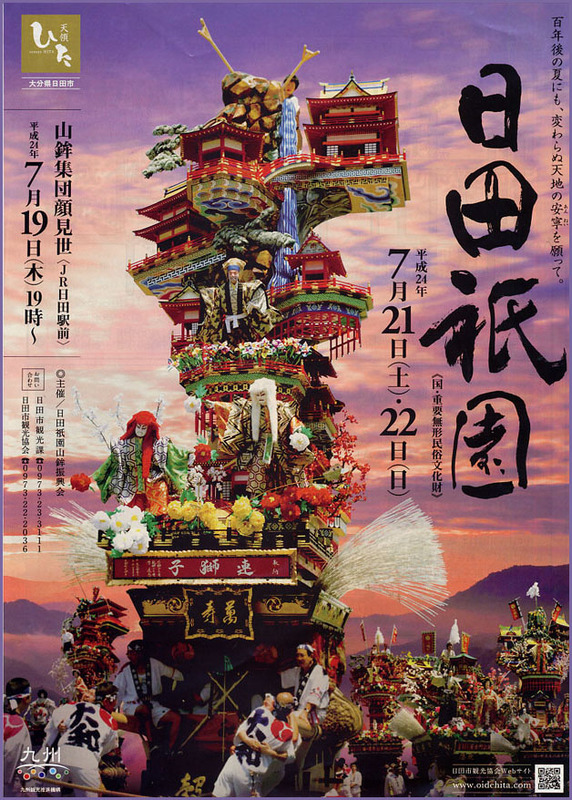 The Gion Festival Centre in Kuma-machi provides information about the history and activities of Hita's annual summer festival, and exhibits six full-sized floats which are paraded around the city during the annual Gion Festival. 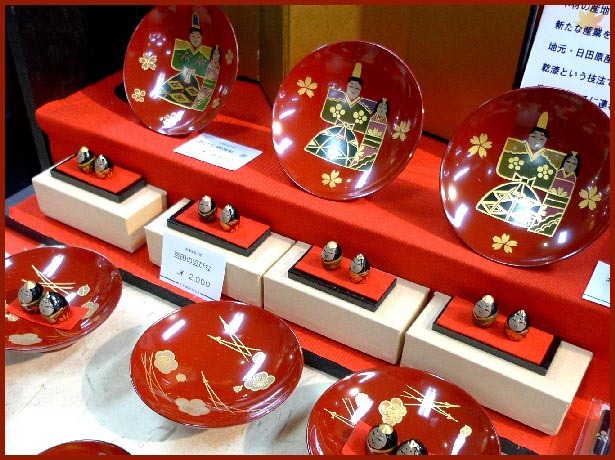 This festival celebrates Hita's Edo period, when it was under direct Tokugawa supervision. 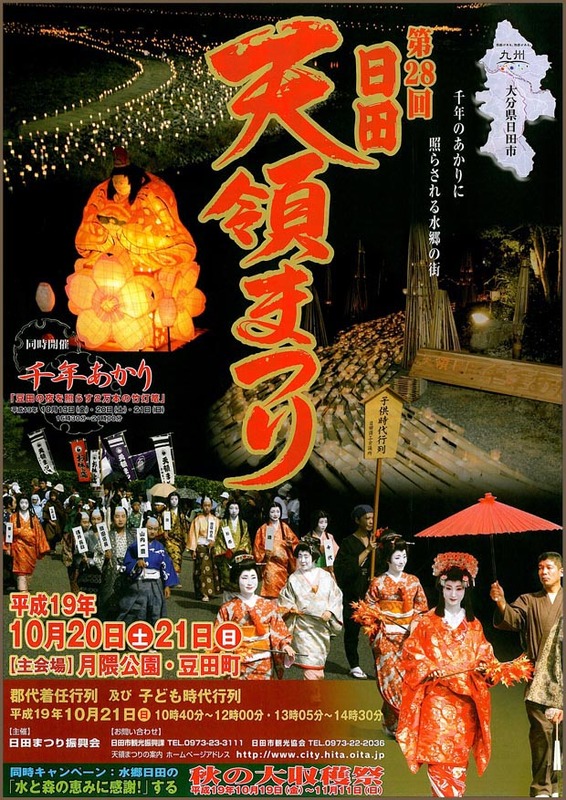 The highlight is a procession of 200 people through the city in full Edo-period costume. The name of the festival comes from the phrase tenryō, used to describe such direct Tokugawa landholdings (Hita was part of the territory overseen by the saigoku gundai, the deputy of the western provinces). 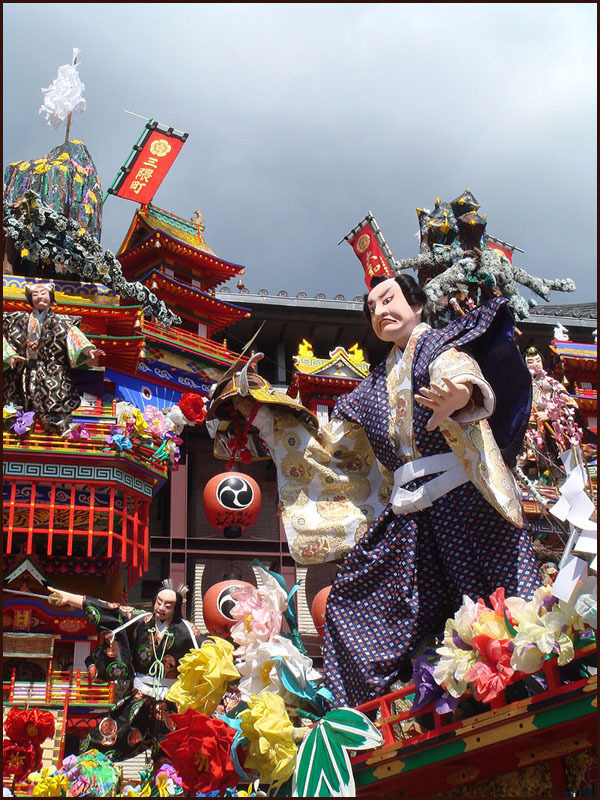 The doll festival is a harbinger of spring in Hita’s Tenryo district. The vividly-colored, elaborate dolls and their accoutrements, which were made from the Edo period to the Meiji era, are displayed throughout the area and attract tourists from all over Kyushu. The exhibitions are held in 20 locations in Mameda-machi and Kuma-machi on either side of the JR Hita Station, and the colorful doll festival atmosphere brightens the neighborhood in a way evocative of ages past. The dolls on display have been well preserved by commercial establishments in the city. 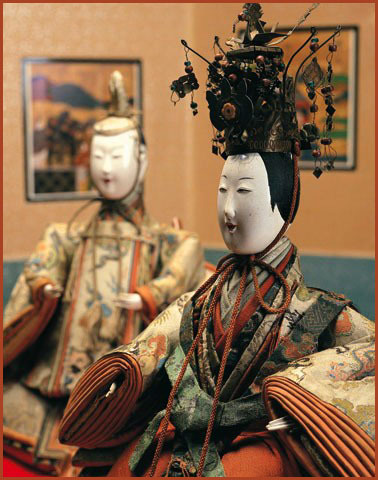 They present an excellent opportunity to see the inherent beauty of traditional crafts, particularly the attractive coloring of the clothing, the workmanship of the accessories, and the unique expression on each doll’s face. The exhibition area itself has many buildings dating from the Edo period and the Meiji era. Mameda has been designated an important traditional architectural preservation district by the national government. Combined with the doll exhibits, the buildings offer visitors a stately sense of history. Hita is dotted with three-story wood frame buildings that date back three centuries, so visitors can also enjoy the street scenes. The 草野本家 Kusano family Hina Dolls can be viewed at the oldest house in Hita during the tourist season. In the March Doll's Festival, up to 200 of the collection are on display at once. kiji uma きじ馬 "pheasant horse"
This model is found in many parts of the Kusu plain, in the north of Oita prefecture. The villages are trying to revive the village life with this toy, especially Oonohara village 大野原 Onohara. The toy is made from plain wood of the magnolia hypoleuca tree ホオノキ, with two wheels and a saddle. It was given to a family when a baby boy war born. It strong and simple making allowed the boy to sit on it and ride it like a horse. 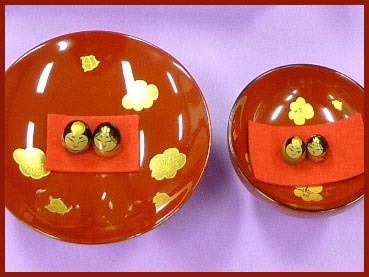 Other villages to make this type are Tobata 戸畑 and Yamaura 山浦. ... Onta Village is one of the most unique places to discover in all of Japan - and that's not just in terms of its ceramics. Administratively, Onta is part of Hita City in central Northern Kyushu, right on the Oita side of the Fukuoka - Oita prefectural border. Hita itself is an ancient town with plenty of historic quarters to visit. The first thing you will notice when you walk into the village, are the ancient style water-powered wooden hammers whacking away at piles of yellow clay. The thump-thump- thump of the hammers echoes through the entire valley, providing a unique soundtrack to your walk. Every house in the village is close to the river flowing through it and they all use the power provided by the water to get their clay powdered - the base of their ceramics. dates back centuries at least: the wooden beam that carries the hammer has a large hollow carved in. That hollow fills with water, the weight of the water raising the hammer. After a few seconds, the beam is raised by that weight so high up that the water flows out - which lets the hammer whack down. The procedure repeats, repeats and repeats. You can see that some of the beams already have noticeable cracks in them - they will be replaced soon. consists of ten families, all with their large houses and all with their own kilns. All pottery here is produced in ancient ways. The water-powered hammers prepare the clay. The clay is then watered by hand and readied for the potter's wheel where the shapes of the plates, cups and bowls are formed by hand while the wheel is driven by the potters' feet. The typical Ontayaki patters are impressed on the ware manually with combs, brushes or irons. the wares are then dried on boards outside the houses before they go into the wood-fired kilns for burning and glazing. No modern machinery is used in the production process at all. All wares are manufactured exactly the way they were when the village was set up 300 years ago. has been only possible by maintaining a social structure of the most conservative kind. One young woman encountered at a visit to Onta relayed that she had grown up in a modern metropolitan area. She fell in love with an Onta boy and they married. That was the end of going to clubs and bars. She had to become a real potter's wife, spending all her waking hours on the family pottery work. She grew to enjoy that way of living, she said, though she admitted that it was tough in the beginning. Every family pottery has its own store. Most likely you will have to go look and find someone of the family and interrupt them in doing some other work to serve you. Onta Ware is heavy-duty ceramic for daily use. 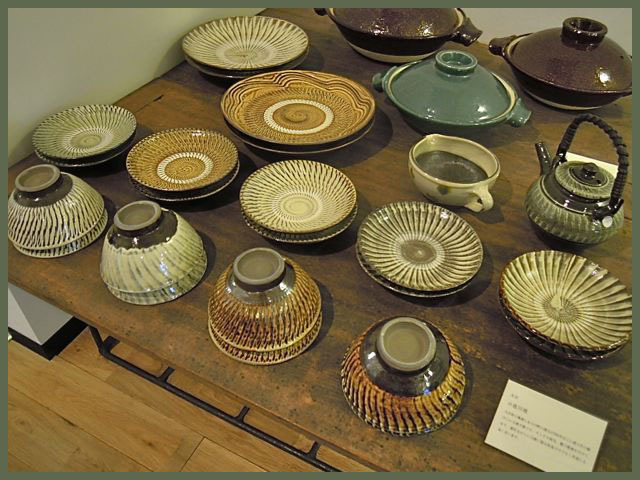 Most of it is basic kitchenware like plates, bowls and tea cups but also vases and traditional drink pitchers. It's beautiful and every piece is handmade and unique. 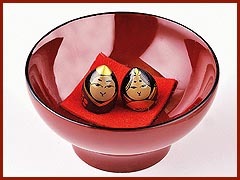 Made from the wood of the Hita cedar trees. Yamawaro is a mixture of man and monkey.